So your building a website? You just want to get it done and dont have time to write the text to fill out the pages just yet. Or your short of time and you need to show your client a working version of the website or layout. Well here is a handy website that will generate some dummy text for you to quickly add to the website or layout so you can get that important deadline with your client met on time. This website generates the standard Ipsum Lorem text that you can quickly add where needed so you are not showing just a blank screen or boxes in your layout. What is even better is that you are not just stuck with the standard Ipsum Lorem text. 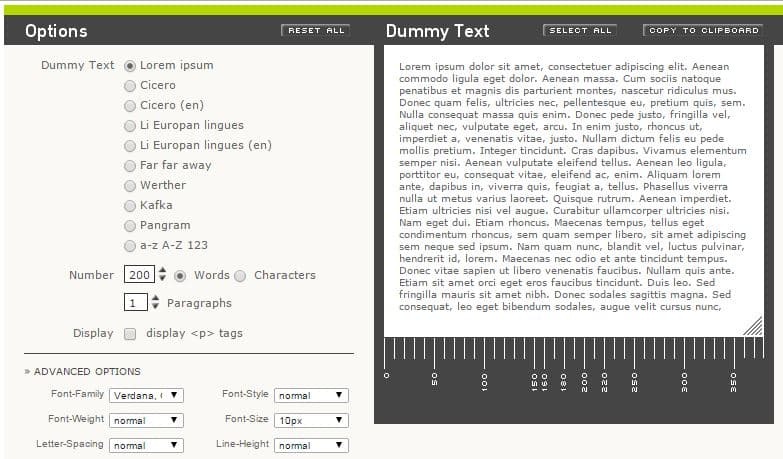 This website gives you a lot of options to work with, you can change the language, the paragraphs etc It even gives you advanced options to change the font, font size, text alignment and on and on. This website is a must for designers needing to meet the demands of their clients.